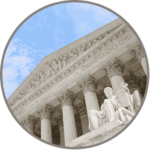 P306 - Digital Recording for hearing rooms, interrogation rooms, lecture halls, and more. With six output channels, this mixer is perfect for providing audio to video conferencing, phone conferencing, public address, and assistive listening systems. The six input channels can be routed and mixed to any of the four output channels. Designed to be used with the JAVS FlexMic, P306 can also be used with other microphones with help from the MPA Adapter. Get the most out of this product by pairing it with JAVS audio recording software Notewise. Each of the 6 inputs on the P306 can be recorded as a separate channel in your recording software. This not only allows you to have a visual indicator of which person is speaking at any time, but it also allows you to mute channels on playback to clearly hear what an individual is saying, even when people talk over one another. Every input channel can be assigned its own output channel, or you can assign multiple inputs to a single output channel. Instead of turning microphones on and off, the Automatic Gain Sharing in each P306 will automatically increase the gain of any microphones that are active and reduce the audio gain of any microphone that is not active, producing the same effect as turning microphones on and off, but eliminating any clipping noises that might destroy the integrity of the recording. Microphone Proximity Awareness TM guarantees that the P306 will automatically choose the correct microphone to turn “on” when more than one microphone is picking up the same sound. This ensures proper recording even for closely located microphones. Moreover, the P306 can detect when a sound source moves from one microphone to another and automatically adjust the gain of the microphones to eliminate phase variance. This will also eliminate the “tin-cup” sound that is common among other non-intelligent mixers. RGB Indicator Lights allow the P306 to inform the User if the system is in Record Mode or if an error has occurred. The P306 can also switch the function of the programmable push button for Push to Mute, Push to Talk, Hold to Mute, or Hold to Talk. The push button could even be configured for any 3rd party application as well. Configurable microphone pickup patterns mean that the FlexMic can be adjusted for any potential recording scenario, ensuring audio clarity in any situation. The P306 features 6 FlexMic inputs and 4, 3-pin phoenix connector outputs along with a front headphone output. 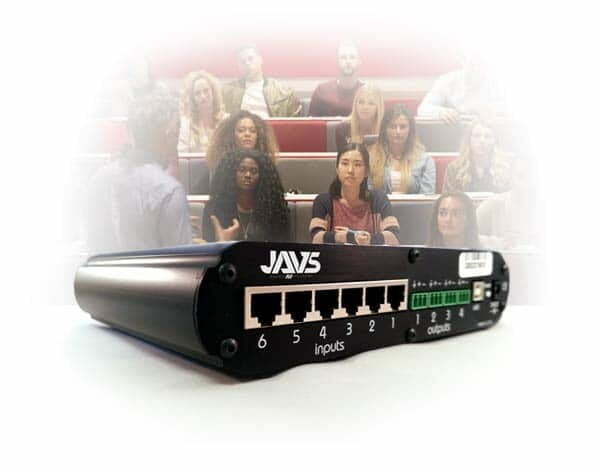 For audio devices other than the FlexMic, a JAVS Mic Preamp Adapter can be used to connect any other audio input desired. The Last Microphone On TM feature allows the P306 to keep “on” the last active microphone, allowing the speaker to move a large distance away from the microphone and still remain heard in the recording. Dynamic Adaptive Threshold TM allows the P306 to detect when a “noisy” audio source is located close to a microphone and identify the noise as an unacceptable source. The system will automatically lower the gain of the identified input until someone speaks, aiding in a superior record for audio. Each of the 6 outputs on the P306 can be configured as a Global Mute output. Whenever the Global Mute command is sent to the mixer, all global mute outputs will automatically mute. In addition, each output can be configured independently to output sound masking whenever Global Mute is applied.